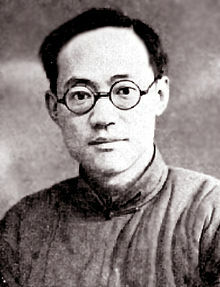 Li Yaotang 李尧棠 (or Li Feigan; Zi: 芾甘) (November 25 1904 – October 17 2005) was a Chinese writer and anarchist; he was most famous under his pen name of Ba Jin (巴金, also written Pa Chin). He created this pseudonym in 1929 from the first syllable of Bakunin and of the last syllable of Kropotkin, the famous Russian anarchists. In the past several years, my hard work, my books which I wrote through blood and tears, and the purpose of my life all has been focused on: helping everyone to have a spring, so that everyone's heart will be bright, everyone will have a happy life, and everyone will have the freedom to develop in any way they want. Only by not forgetting the past can we be the master of the future. In the past several years, my hard work, my books which I wrote through blood and tears, and the purpose of my life all has been focused on: helping everyone to have a spring, so that everyone's heart will be bright, everyone will have a happy life, and everyone will have the freedom to develop in any way they want. I aroused people to have thirst for, thirst for brightness; I put a cause in front of people, a cause which is worthy of people's devotion. But all of my hard work was destroyed by another power. After arousing a young soul, it only made him or her suffer more unbearable trampling torment. The unreasonable social system, the marriage without freedom, the yoke of traditional ideas, and the family autocracy, destroyed we don't know how many young souls. In my twenty eight years, I already had it accumulated so many, so many shadows. In that autumn smile, in that smiling which was the same as crying, I saw the young people's corpses in the whole past generation. It was as if I heard a painful sound saying: "This must be ended." Victory is for them, not for us. We have not made profit out of our country's misfortune. Victory does not bring us luck. I felt a joy in my heart, which seemed filled with love, love for the sun, the snow, the wind and the hills, love for everything around me. It was in this mood that I walked down the snow-covered path dotted with black footprints. Further down the footprints mingled and made dirty little puddles. I picked my way over the thickest snow because I loved the crunching of snow underfoot. With the sunlight pouring down and a breeze in my face I felt that balmy spring was coming to meet me. I've lived on royalties all my life. It is the readers who have supported me. I write just because the fire of my emotion is burning. Had I not, I would not have been able to find peace. We cannot forget what had happened and history should not repeat itself. Loving truth and living honestly is my attitude to life. Be true to yourself and be true to others, thus you can be the judge of your behavior. I believe in the future a new Dante will write a new Divine Comedy. Nobody would say the cowshed was heaven and nobody would say the inhuman torture of so many victims be called a revolution of the proletariat. 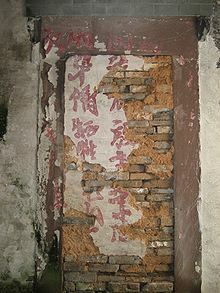 … A museum should be established to remind China of the follies and disasters that had fallen from 1966 to 1976. We cannot forget what had happened and history should not repeat itself. I have spent myself on all kinds of things … I have advanced much politically but I have written little and moreover have written it badly. Today I read your autobiography in two volumes, Living My Life. These two books full of life, shocked me greatly. Your roaring of forty years like spring thunder, knocked at the door of my living grave throughout the whole book. At this time, silence lost its effect, the fire of my life was lit, I want to come to life and go through great anguish, immeasurable joy, dark despair and enthusiastic hope, throughout the peak and the abyss of life. I will calmly go on living with an attitude you taught me until I spend my whole life. He had read of people with such public spirit and unselfish character only in novels. He had regarded them as nothing but ideal, imaginary creations of literary writers. Now he has seen such a hero in the flesh with his own eyes. The doctors realized very clearly that their minds and emotions were changing from day to day. On the one hand they were healing the patient, and on the other it looked as if they were healing themselves too. The battle to save life is still going on. This battle to save life will eventually be won. … Blind faith in established experience has been shattered, outmoded regulations have been smashed. According to the world's highest medical authorities, burns extending over 75 per cent of a person's body are regarded as likely to prove fatal. The burns of these two patients were not only extensive but also deep, even involving their muscles in many places. Therefore all the experienced surgeons frowned, shook their heads, and expressed their utter inability to save the lives of these men. One of them said, "It is only a matter of three or four days." Another suggested, "At most three days." Still a third one said, "Whether medicine is used or not is immaterial, for in spite of all efforts the patients will die." Everybody seemed to agree on one conclusion "death." In this way the joint consultation was concluded in a very pessimistic and hopeless atmosphere. On the basis of mortality statistics in international medical literature it seemed that these badly burned patients were doomed to die. But the Party organization of the hospital would not agree to such a pessimistic view. The secretary of the general Party branch and the assistant secretary of the medical department branch immediately summoned the doctors treating the patients for a talk, and following that a meeting of all the responsible doctors was convened. The problem was analysed from a class viewpoint, and it was stressed that in capitalist countries it was impossible to obtain the full use of all resources to save the lives of burned workers, but that in our socialist country it was possible to mobilize everything available to save them. For this reason we should not always accept the medical statistics of capitalist countries and allow them to influence us. The Party secretary called the attention of the doctors specially to the following points: First, that they must try to rid themselves of their blind reliance on established bourgeois medical experience, and they must try to think, speak and act in bold new ways. Secondly, they must follow the mass line and depend more upon the power of the people. Finally he said, "The Party will do everything possible to save these steel workers who have created vast wealth for the nation." When they accepted their assignments they were not very confident, especially the assistant head surgeon who simply believed in his own past experience, in the statistics of international medical literature, and in the medical equipment and resources of the hospitals in capitalist countries. Therefore when he first heard the talk of the vice-superintendent, who was the secretary of the general Party branch, he had some inner feeling of resistance. He thought to himself, "This is simply coercing people to try and do the impossible! But since I have accepted the assignment I'll do what I can. At any rate, the patients will die either in the shock stage or later." With such downhearted feelings he entered the ward to see his patients. Looking at this immensely swollen face in front of him the doctor gently consoled the patient, "Comrade, don't worry and you will recover." As a matter of fact, he was thinking quite the opposite, "You will die. I can be of no more help." Later the assistant chief surgeon told people that he had been a surgeon for eleven years, had seen not a few patients die and consequently had become quite cold and indifferent. He was interested only in diseases as such and had no feelings for his patients as people. But what Chiu Tsai-kang had said impressed him deeply. Even after he left the patient's room he thought it over for quite a long while. Here was a man awaiting death who had to clench his teeth to endure the searing pain of his whole body, but who constantly had the nation's steel production on his mind and who wholeheartedly desired to return to his furnace. In the past, he had read of people with such public spirit and unselfish character only in novels. He had regarded them as nothing but ideal, imaginary creations of literary writers. Now he has seen such a hero in the flesh with his own eyes. When alone he secretly shook his head. But suddenly he recalled the analysis made by the Party secretary regarding "two kinds of social system, two attitudes, and therefore two different results." He felt as if he had seen a ray of light in the darkness. He said to himself, "Lao Chiu can endure pain of such magnitude, and in spite of his burns he is always thinking of going back to the furnace. He wants to live. Why should he not be able to live?" That moment, suddenly the doctor and the patient were drawn closely together. From then on, the doctor thought of the patient often and also tried to compare himself with Lao Chiu. The more he compared the more he felt ashamed of himself and the more eager he was to do his best for this worker. So, from the very first day the assistant surgeon learned something from his patient. The doctors realized very clearly that their minds and emotions were changing from day to day. On the one hand they were healing the patient, and on the other it looked as if they were healing themselves too. It was this chief surgeon who first volunteered to offer his skin when grafting began. This was a good beginning. All the outmoded rules of the hospital were broken. Minds which had been tied down by subservience to foreign experience were now set in motion. People began to speak, to think and to act boldly. A new world opened in front of them. They knew that what they were doing now was something unprecedented which doctors in capitalist countries had not been able to do. They were engaged in a battle to save lives and as the scope of the battle became wider an increasing number of people were drawn in. Later on when a difficulty occurred in the course of treatment they solicited the opinions of many doctors both within and without the hospital, depending on the wisdom of the many to tide over one crisis after another. The changes in the chief and the assistant chief surgeon were most noticeable. At first they felt that they were just fulfilling their duty to the injured worker but were very dubious about the result. But then, full of confidence they really began doing their best. Lao Chiu's burns were so extensive that, with the exception of his scalp, two shoulders, the waist where his leather belt was worn and the soles of his feet, pratically his whole body was affected. His back and hips were burned deeply and his right leg was even worse. Every time it was necessary to turn him over and change his dressings ten doctors and five nurses were required and the process took several hours. Moreover, the patient suffered very much and was short of breath for a long while. During all these days Lao Chiu was lying on the bed suffering continual pain. The doctors and nurses did their utmost to reduce his suffering to the minimum, but they could not completely relieve it. Even the chief surgeon said once, "When we were healing him I often thought that if another person was in his place he certainly would not have stood it so long, but Lao DChiu endured everything. When I saw him grinding his teeth to suppress his groans, I felt so touched that the tears feel from my eyes." Indeed he suffered great pain for a long period. While changing the dressings even laughing gas anaesthesia could not keep him quiet. Sometimes these pains were so intense that his whole body trembled uncontrollably. The battle to save life is still going on. Up till now Lao Chiu has already lived for forty-four days. He lives on stubbornly and endures all suffering. Already he has become a banner, a fresh red banner. Many people regard him as a source of encouragement and as a model for them. Many consider him as a personification of the noble qualities of the working class and as a shining example of the great spirit of communism. This battle to save life will eventually be won. The fact that Lao Chiu has lived until now is already a medical marvel. He has passed through one crisis after another and later he may face still more. But he will certainly live. Blind faith in established experience has been shattered, outmoded regulations have been smashed. He wrote that the main mistake of his generation was having "said too many empty words" in the Maoist age to please the cultural bureaucrats.